Stacy Friedman: Repeated Remembrance is on view from March 8 through April 30, 2019, with a public open house to be held by the Friends of the Jamaica Plain Library on Saturday, April 6, 2:30-4:30 PM. The library is open Monday-Wednesday 10-6, Thursday 12-8, and Friday-Saturday 9-5 (closed Sundays). The exhibition space is located on the lower level. A resident of Jamaica Plain for over 30 years, Kevin Gillespie paints serene, closely studied scenes of his neighborhood’s many natural wonders, including Jamaica Pond and the Arnold Arboretum. His work, often done en plein air, captures the shadows of tree branches, the ripples of water, and the changes of the season observed along the well-trod paths of the region’s parks. The medium of watercolor allows for subtle gradations in color and texture along with small details like fallen leaves and footprints in the snow. Kevin Gillespie: Local Scenes is on view from January 4 through February 28, 2019, with a public open house to be held by the Friends of the Jamaica Plain Library on Thursday, January 10, 5:30-7:30 PM. The library is open Monday-Wednesday 10-6, Thursday 12-8, and Friday-Saturday 9-5 (closed Sundays). The exhibition space is located on the lower level. A graduate of both RISD and the University of Kansas, Myles Dunigan combines different printmaking styles with photography and other media to produce layered, textured landscapes that straddle the line between abstraction and realism, equally reminiscent of the black and white photographs of Ansel Adams and the mixed media experiments of Anselm Kiefer. 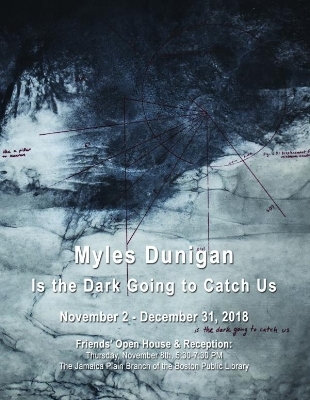 Myles Dunigan: Is the Dark Going to Catch Us is on view from November 2 through December 31, 2018, with a public open house to be held by the Friends of the Jamaica Plain Library on Thursday, November 8, 5:30-7:30 PM. The library is open Monday-Wednesday 10-6, Thursday 12-8, and Friday-Saturday 9-5 (closed Sundays). The exhibition space is located on the lower level. A graduate of RISD, Kristen Gossler creates complex layered works built up from a variety of materials, including water-based pigment, screen printing ink, sumi ink, and acrylic paint. Each of her expressive abstract paintings poses a question, seeking to engage the viewer in an interactive experience. She pulls from a mental inventory of repeated forms found in both the natural and manmade worlds, provoking a familiarity and comfort in the viewer through subliminal means, as well as encouraging personal connection with the work. Kristen Gossler: Confluence is on view from September 7 through October 31, 2018, with a public reception to be held on Thursday, September 13, 5:30-7:30 PM. The library is open Monday-Wednesday 10-6, Thursday 12-8, and Friday-Saturday 9-5 (closed Sundays). The exhibition space is located on the lower level. For 50 years, Lohr has been turning her camera towards the world around her, capturing the energy of live musical performances, the camaraderie between friends, the ghosts of abandoned buildings, and the spontaneity of urban life. For her, art is about storytelling, and she uses photography to communicate infinite narratives for viewers to interpret. Joni Lohr: Unfinished Stories - A Social Documentary is on view from July 6 through August 31, 2018, with a public reception to be held on Thursday, July 12, 5:30-7:30 PM. The library is open Monday-Wednesday 10-6, Thursday 12-8, and Friday-Saturday 9-5 (closed Sundays). The exhibition space is located on the lower level. A graduate of the Massachusetts College of Art, O’Connor has been exhibiting in Boston since the early 1980s, and her work held in numerous public and private collections, including the Federal Reserve Bank of Boston, Goodwin and Proctor, and Fidelity Investments. She is known for her playful still lifes of so-called tchotchke’s -- miscellaneous objects collected around the home -- and candy, often paired with floral or polka dot wallpaper. Maureen O’Connor: Just Ducky is on view from May 4 through June 30, 2018, with a public reception to be held on Thursday, May 10, 5:30-7:30 PM. The library is open Monday-Wednesday 10-6, Thursday 12-8, and Friday-Saturday 9-5 (closed Sundays). The exhibition space is located on the lower level. This exhibition is proudly sponsored by Optical Designs, Inc., a family-owned and operated business located in the heart of Jamaica Plain. Raised in New Hampshire, Klos studied art and psychology at the School of the Museum of Fine Arts. Her projects focus on manipulating the validity of photography and creating dual realities that breathe life into situations where visual manifestations may not be available. Cassandra Klos: Mars on Earth is on view from March 2 through April 30, 2018, with a public reception to be held on Thursday, March 8, 5:30-7:30 PM. The library is open Monday-Wednesday 10-6, Thursday 12-8, and Friday-Saturday 9-5 (closed Sundays). The exhibition space is located on the lower level. Born and raised in Caracas, Venezuela, Liliana Marquez has always been part of a creative, multicultural environment. She has dedicated her artistic practice to the concept of reclamation, relying on found and recycled materials--often taken from construction sites--to create sculptural wall-hanging abstractions. Liliana Marquez: RePOPART is on view from January 5 - February 25, 2018, with a public reception to be held on Thursday, January 11, 5:30-7:30 PM. The library is open Monday-Wednesday 10-6, Thursday 12-8, and Friday-Saturday 9-5 (closed Sundays). The exhibition space is located on the lower level. This exhibition is proudly sponsored by The Friends of the Jamaica Plain Branch Library. Juan Murray has been working in local real estate since 1994. As with many working artists, his day job shines through in his artistic practice, which takes the form of black and white urban photography. His architectural images are bold and poetic, steeped in chiaroscuro in his effort to “chase the light” as it interacts with different forms. The extreme contrast of light and dark at times abstracts his subjects, allowing the viewer to take in new details and formal elements of everyday buildings and streets. His figures are generally cast in shadow, dwarfed by their surroundings, signifying a kind of awe for man-made structures while also reflecting the anonymity of urban living. Together the series stands as a visual commentary of the contemporary city experience, with glass-and-concrete architecture towering over residents, allowing equal parts sunshine and darkness to fall. Juan Murray: Interplay is on view from November 3 through December 30, 2017, with a public reception to be held on Thursday, November 9, 5:30-7:30 PM. The library is open Monday-Wednesday 10-6, Thursday 12-8, and Friday-Saturday 9-5 (closed Sundays). The exhibition space is located on the lower level. Born and raised in China and currently based in Boston, today Shao Yuan Zhang depicts vast forest landscapes and red rock canyons with a surreal, otherworldly vision. His simplified forms accentuate a stark, isolated experience emotionally resonant with his immigrant journey. Each monotype was created with Asian rice paper using a technique derived from ancient Chinese painting. Based in Jamaica Plain, Cristina Rosa Nelson combines her academic expertise in history and gender theory with her multicultural background through whimsical, multivalent collages and assemblages. Cristina Rosa Nelson: IKONOPLASTIC is on view from July 7 through August 31, 2017, with a public reception to be held on Thursday, July 13, 5:30-7:30 PM. The library is open Monday-Wednesday 10-6, Thursday 12-8, and Friday-Saturday 9-5 (closed Sundays). The exhibition space is located on the lower level. The debut show for May and June highlights the work of Steven Edson, a photographer based in Belmont. With a keen eye for detail and fondness for pattern and texture, Edson captures abstract selections of paint found on city streets, boiling them down to an essence of line, shape, and color. Steven Edson: Road Paint is on view from May 5 through June 30, 2017, with a public reception to be held on Thursday, June 8, 6:00-8:00 PM. Please check the library website for hours. After closing its Centre Street doors in October, Uforge is excited to embark on a new collaborative partnership with the Friends of the Jamaica Plain Branch Library. Founded in 1952, the Friends are committed to sponsoring and supporting various cultural and educational programs at the JP Branch of the Boston Public Library, and have been planning new ways to enhance its artistic offerings. The branch is currently undergoing major renovations, which will result in new public exhibition space available for local artists when it reopens in May 2017. The Friends have teamed up with Uforge to create a new proposal-based exhibition program, inviting artists to submit their work for solo or group exhibitions to be displayed in the JP Branch’s space throughout the year. After a group of community members and BPL staff select the artists, Uforge will manage the exhibits and accompanying events. The Boston Public Library is allowing this partnership to take place in their building as they strive to find new innovative ways to collaborate with the community. “We are looking forward to bringing our curatorial and organizational skills to a new venue, while continuing to promote local artists within and beyond the Jamaica Plain community,” said Brian Crete, the Director of Uforge. “After more than a decade of advocating for a renovation that included exhibit space, we are so excited to embark on this partnership with Uforge to manage the new gallery space. We are grateful that the BPL was receptive to this pioneering approach to engage the JP community and enliven the branch with enriching art displays,” said Don Haber and Gretchen Grozier, Co-chairs of the Friends of the JP Branch Library.